Busy schedule, crazy shifts and lack of energy is what my life is all about. No one ever said to me that being a nurse was easy but I never thought it could be so exhausting sometimes. Working shifts is something that can easily disrupt your sleeping pattern and to have something that will help you with that is a blessing. 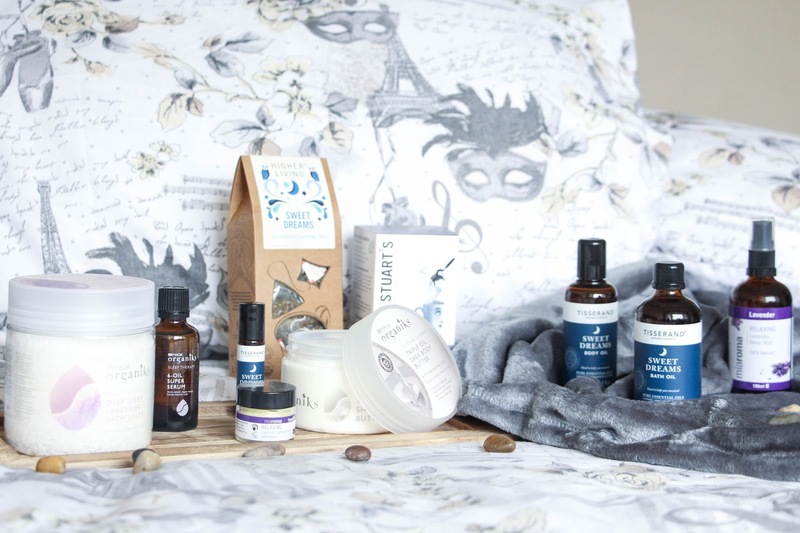 When Holland & Barrett contacted me to try out their sleeping beauty range, I was over the moon and could not wait for no more sleepless or restless nights. 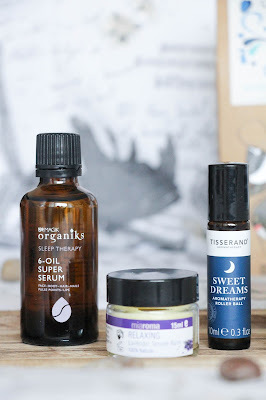 They kindly sent me a few products that aim to help you relax and settle to have a deeper sleep and here are my thoughts on them. Beware that this is going to be a long post as there is quite a few products for me to rave about so grab your drink, sit back, read and relax!
. Deep Sleep Lavender Bath Salts* – run a hot bath and throw in there 2-4 handfuls of the Deep Sleep Lavender Bath Salts for the most relaxing minutes of your day. Inhaling the lavender scents is definitely the most calming thing I have ever experienced.
. Triple Oil Shear Body Butter* – after the relaxing hot bath, rub yourself in the body butter for the most wonderful scent and hydration feeling. I have been trying to apply this everyday after bath or shower and I definitely notice a big difference since I have very dry skin. This is such a creamy, nourishing product!
. Deep Therapy 6-Oil Super Serum* – an oil that you can apply on your face, hair, nails and body? This is the one and let me tell you – it does wonders! I apply it on my face and hands and it feels very hydrating. When applying it to my hair, it does makes it feel much softer and not at all oily. I have used this product for the last week and my dull hair is slowly improving and I can’t wait to see what this will do long term. My skin is also smoother, specially on my face (where I apply this product the most). I let it sink in for about 15 minutes to then apply my night moisturizer. This has to be my perfect pamper routine after an horrible day or night at work. Actually, as you are reading this, I am already in bed of what I know it will be a busy and stressful night shift and this is the perfect way of leaving all the stress and bad energies behind. It completely relaxes me and I can’t feel more grateful for finding such amazing, calming products. I will definitely recommend you to buy this pack and it is a beautiful getaway from all your problems. Following this pamper routine at least once a week will definitely do wonders to your mood. The next two products are definitely amazing to combine with the Dead Sea Spa Magik Sleep & Moisture Therapy. It will create the most amazing combination for a relaxing pamper evening.
. Tisserand Sweet Dreams Body Oil* – to perfect your pamper routine after the Dead Sea Spa Magik Sleep & Moisture Therapy, nothing better than spreading this soothing and hydrating oil all over your body. Not only it feels amazing on your skin but it also relaxes you with the beautiful lavender scent. 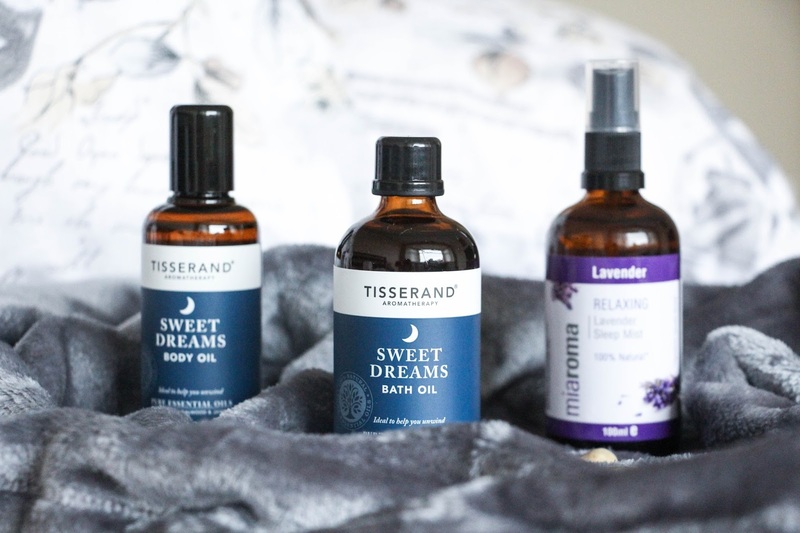 It is perfect to use for massages too – I am still yet to try it that way but I am sure it will be even more relaxing.
. Tisserand Sweet Dreams Bath Oil* – mixing this bath oil with the Deep Sleep Lavender Salts is definitely the way to go for! If you don’t love the intense scent of lavender, it might not be ideal for you (my boyfriend was complaining of how intense it was in the bathroom) but if you are like me and absolutely adore the smell of lavender, this combination is for you. I stayed in the bad for at least 25 minutes and honestly, inhaling the scent of these two products together was such a great, calming moment. I could feel myself drifting away from all the stress and worries I had. But let’s be real – not everyone has time for a 20 minute bath followed by body oil, body butter and so on and although it does feel amazing when you have time to pamper yourself that way, it is also great to have something to just put on that only takes a few seconds and still makes you feel as relaxed as having a full on pamper routine and this is all these three next products are about.
. Miaroma Relaxing Lavender Sleep Mist* – I can’t tell you how much I love lavender scents but I really never thought it could be so relaxing. Spraying this mist around my bedroom and bedding is another step added to my night time routine. Use it either straight before getting into bed for a more intense feeling or a few minutes before if you have a boyfriend like mine that is very picky with these things. I honestly use it everyday and I don’t know if he can actually tell apart from the fact that he does sleep much better!
. Miaroma Relaxing Lavender Temple Balm* – this is a lovely thick balm that you can quickly apply when in bed on your wrists, back of your ears and neck for a relaxing and calming feeling. Again, beautiful lavender scent – this is what this range is all about – and a must do on those very stressful and annoying days.
. Tisserand Sweet Dreams Aromatherapy Roller Ball* – An easy go-to product that will instantly calm you is this roller ball. Not only before going to bed but if you have any fear of traveling or anxiety at all, this will definitely drive you into a nice, relaxing bubble. I am not one that really suffers from anxiety but I do notice to instantly feel more relaxed when I apply this on my pulse points (writs and back of my ears, for example). It is a product that I have been reaching out to every single night as it is so easy and quick to use and it does work wonders. Last but not least, they have also sent me two different teas that are caffeine free (obviously) and perfect to relax in the evening or night time. I have to say that I am very picky when it comes to teas. I don’t really love tea and so it was quite difficult for me to try these two products. Yet, I have tried each one of them a couple of times and my boyfriend has been having them regularly – he is a tea lover.
. Higher Living Sweet Dreams Tea* – a pack of 15 tea bags with a mix of lavender, peppermint and cinnamon, this is a sweet, unique tea full of natural herbs that will be the cherry on top of the cake after that busy day. If you love peppermint tea, this is for you as I feel like that is the predominant taste of this tea. Approximately thirty minutes after having this tea I felt much more calm and relaxed! 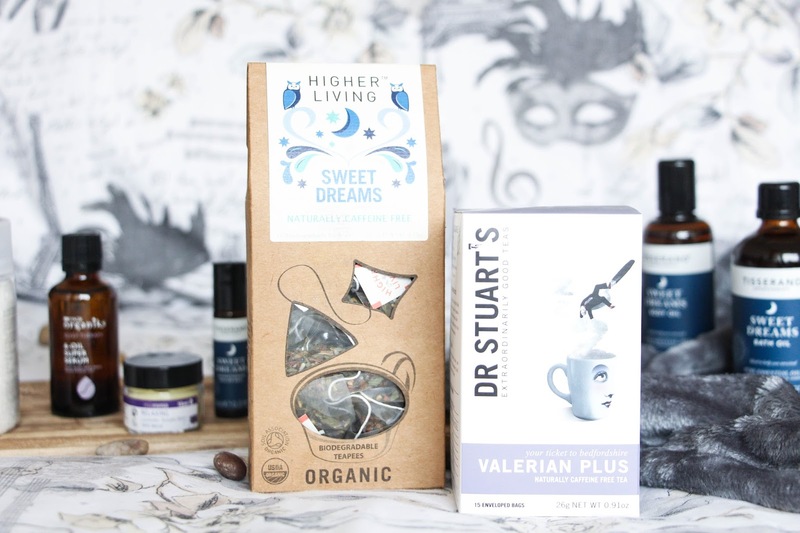 I would say that this is the tea you can have in the evening just to relax a bit while the next one is to have just before bed.
. Dr Stuarts Valerian Plus Tea* – If you do want a tea to improve your sleep, this might be the one. A blend of valerian, lime flowers and hops make the perfect recipe for a relaxing night time tea. They recommend you to have this tea up to an hour before bed and I have to say that it sort of works! It makes you feel slightly drowsy without you even noticing. At least it is what it does to me but remember that everyone is different so while it does work for me, it might not work for you. For a person that does not love tea, the taste of this one is quite pleasant. Will definitely reach out to it on those days where I feel like I have a lot in my mind that might trouble my sleep. 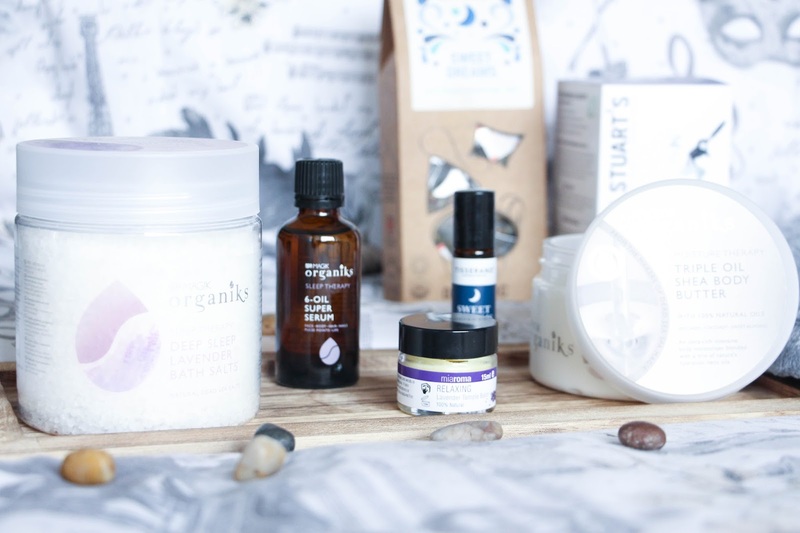 Trying out all of these new products was definitely a great experience and I have to thank Holland & Barrett for such a wonderful collaboration. If you are someone that definitely needs some “me time” or is always under a lot of pressure and stress, trying out a few of these products is definitely worth it. A bath lover will absolutely adore the Dead Sea Spa Magik Sleep & Moisture Therapy – three products together in a wonderful box that will guarantee you a more relaxing night. If you are the one that prefers a much quicker but still effective routine, I would totally advise the Miaroma Relaxing Lavender Sleep Mist and the Tisserand Sweet Dreams Aromatherapy Roller Ball – two easy and quick products to apply that will really change your night routine and your mood before bed. From all the products that I was able to try, the three above mentioned are definitely my favourite and the ones that I will probably repurchase as I am using them almost on an everyday basis.